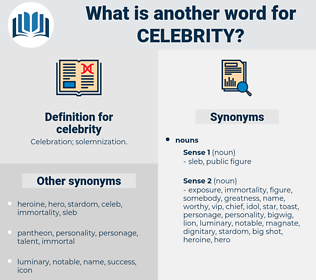 What is another word for celebrity? nobody, obscurity, nonentity, unknown, commoner. discredit, humiliation, ignominy, oblivion, inconspicuousness, odium, mediocrity, anonymity, disrepute, obscureness, shame, dishonor, disgrace, lightweight, unpopularity, contumely, contempt, has-been, invisibility. The date - trees of Al - Madinah merit their celebrity. For myself, I prefer fame to life; and yet, the consciousness of heroic deeds to the most wide - spread celebrity. 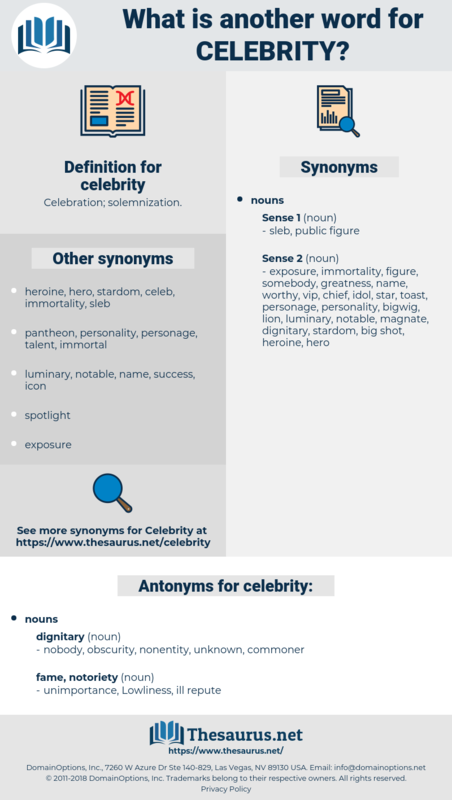 notable, social lion, lion, luminary, toast, personality, immortal, leading light, guiding light, notability. important person, influential person, personage.